Description: On June 22, the cavalry divisions of Brig. Gen. James Wilson and Brig. Gen. August Kautz were dispatched from the Petersburg lines to disrupt Confederate rail communications. Riding via Dinwiddie Court House, the raiders cut the South Side Railroad near Ford’s Station that evening, destroying tracks, railroad buildings, and two supply trains. On June 23, Wilson proceeded to the junction of the Richmond & Danville Railroad at Burke Station, where he encountered elements of William H.F. Lee’s cavalry between Nottoway Court House and Blacks and Whites (modern-day Blackstone). Wilson followed Kautz along the South Side Railroad, destroying about thirty miles of track as he advanced. On June 24, while Kautz remained skirmishing around Burkeville, Wilson crossed over to Meherrin Station on the Richmond & Danville and began destroying track. 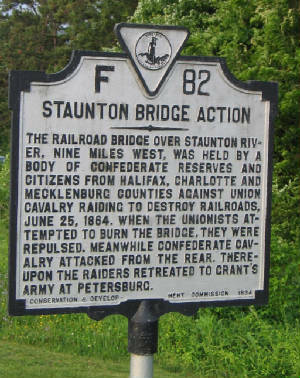 On June 25, Wilson and Kautz continued tearing up track south to the Staunton River Bridge, where they were delayed by Home Guards, who prevented destruction of the bridge. Lee’s cavalry division closed on the Federals from the northeast, forcing them to abandon their attempts to capture and destroy the bridge. By this time, the raiders were nearly 100 miles from Union lines. The Staunton River Bridge, 600 feet long, crosses the Staunton River and was part of the Richmond & Danville railroad supply route from the west and south for Confederate troops during the Civil War. In 1864, it was successfully defended by 'Old Men and Young Boys' during the Wilson-Kautz raid. Today it is part of the walking trail between the Clover Visitor Center and the Roanoke Vistor Center. This trail is 0.8 mile long and follows the old railroad bed allowing visitors access to the park from either side of the river. 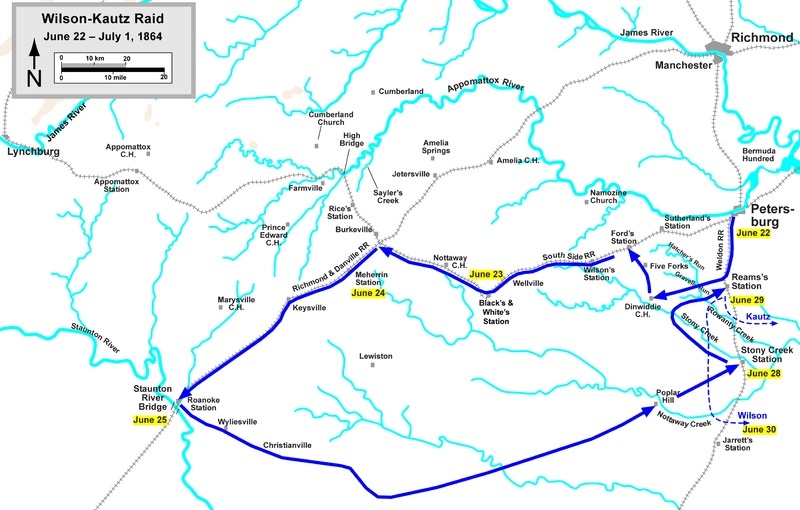 Instead of marching directly overland from Washington, McClellan used Federal sea power to advance on Richmond by way of the peninsula between the York and James Rivers. The "Grand Campaign," however, soon belied its creator's Napoleonic pretensions by becoming a three-and-a-half-month nightmare of feints and pitched battles, ultimately engaging up to a combined quarter-million men on both sides and leaving one of every four men dead, wounded, or missing. Using hundreds of eyewitness accounts, Sears demonstrates how the most creative use of military technology (ironclad warships, 200-pounder rifled cannon, battlefield telegraph, and aerial reconnaissance) existed side by side with the most appalling mismanagement (Stonewall Jackson's uncharacteristic lethargy; McClellan's mistaken belief that the numerically inferior rebels possessed a two-to-one manpower advantage; out-of-sync attacks by both Confederate and Union generals). Above all, though, Sears casts the campaign as a clash of wits and wills between McClellan’s courage to command" - and Robert E. Lee - who, upon succeeding the wounded Joseph E. Johnson as head of the Army of Northern Virginia, seized the initiative, repulsed the assault in the series of "Seven Days" battles, and began his long journey into legend. An authoritative, ironic, and stirring addition to Civil War annals. Recommended Reading: Lee's Cavalrymen: A History of the Mounted Forces of the Army of Northern Virginia, 1861-1865 (Hardcover). Description: A companion to his previous work, Lincoln's Cavalrymen, this volume focuses on the cavalry of the Army of Northern Virginia its leadership, the military life of its officers and men as revealed in their diaries and letters, the development of its tactics as the war evolved, and the influence of government policies on its operational abilities. All the major players and battles are involved, including Joseph E. Johnston, P. G. T Beauregard, and J. E. B. Stuart. As evidenced in his previous books, Longacre's painstakingly thorough research will make this volume as indispensable a reference as its predecessor. He considers the role of field fortifications in the defense of cities, river crossings, and railroads and in numerous battles. Blending technical aspects of construction with operational history, Hess demonstrates the crucial role these earthworks played in the success or failure of field armies. He also argues that the development of trench warfare in 1864 resulted from the shock of battle and the continued presence of the enemy within striking distance, not simply from the use of the rifle-musket, as historians have previously asserted. Based on fieldwork at 300 battle sites and extensive research in official reports, letters, diaries, and archaeological studies, this book should become an indispensable reference for Civil War historians.